Portugal is known for its diverse and delicious cuisine, which arguably, can best be enjoyed at one of the many local, hole-in-the-wall eateries in any city or town. Whether we’re talking a rustic lunch counter at a pasteleria, or a mom and pop restaurant tucked away in a tiny side-alley, often called tascas, nothing beats home-style, Portuguese comfort food and drink. But in the sea of all these small restaurants, there has always been one little place in my neighborhood in Lisbon that has never ceased to provide not only excellent, regional food but friendly, personalized service. Over the years, our adoration for it has grown to such an extent that it has become our permanent Saturday lunch spot.Restaurante Imperial do Campo de Ourique, located on Rua Correia Teles, is also known by locals as “A Tasca do João”. Run by João Gomes and his family for over 25 years, João and his wife Adelaide are natives of Ponte de Barca, in the northern region of Minho and have worked in restaurants their entire lives. When they moved to Lisbon and bought the Imperial, the restaurant itself had been a neighborhood icon for more than 40 years, and so they carried on the tradition of great family food and service, which has brought customers back again and again – like ourselves! This impeccable level of quality and personal attention has allowed them to survive – nay, thrive! – through grueling economic waves, while many others have closed shop. At first glance, one wouldn’t imagine that this small little tasca would be so popular, as the exterior neither flaunts a lavish sign, nor flashy lights, just a clean pair of white double doors. But these doors are always cracked open just enough to smell the wonderful aromas floating from the kitchen, not to mention the the joyful sounds of boisterous customers throughly enjoying their meals. Upon entry, you’ll encounter Adelaide who is consistently smiling while hard at work in their open kitchen, as friends and regulars of João are leisurely chatting at the bar savoring an imperial(draft beer) or copo (normally red wine softened with club soda). Stroll back to the cozy dining room, decorated with paintings of the Gomes’ hometown of Ponte de Barca and other mementos collected over the years, and you’ll feel like a part of the family. This success of the tasca can mainly be attributed to the teamwork of João, who runs the restaurant, service and bar and his wife, Adelaide, the sole cook of the restaurant who prepares and cooks everything from scratch. Their son, Nuno, who grew up playing in the restaurant’s basement, became João’s only other server at lunch, while Nuno’s sister Filipa and wife, Mia, pitch in with extra hands for dishwashing when large parties stream into the front doors. But it is João, who is there from opening to close, the grand force behind the restaurant, ensuring that everything runs smoothly and all the customers are happy. I have never met a person so passionate about their job and in the two and half years I have frequented the place, I have never seen him without a smile on his face or quickness in his step. Six days a week, the man wakes up at 4:30am to make it down to Lisbon’s Mercado de Ribeira by 5:30am so as to select the freshest fish for the day’s lunch menu. By 7:00am the restaurant doors are open, with João waiting to greet you with a jolly “Good Morning! How are you!” in Portuguese to his morning coffee customers or just any passersby. Learn more about Portuguese Coffee here. The stream of customers coming in and out for coffee, or a mid-morning “pick me up”, continue until lunch when Adelaide posts a simple, hand-written menu on the door, which always consists of approximately four fish and four meat selection, along with a soup of the day. And there’s no need for a larger menu because any of the options are guaranteed to be both delicious and well-prepared. Just ask João, who gets giddy with excitement whenever he describes a menu item, especially when he’s found an exceptional deal on Portuguese fresh fish that day. When sardines are in season, he’ll be sure to let you know that “hoje, temos sardinhas muita fresquinhas e boas! Espectacular!” (today, we have very fresh, good sardines! Spectacular!) giving a tug on his ear or kissing his fingers in an expression of satisfaction so you really get the point. And it’s hard not to oblige his recommendations, as his expressive and warm personality is so inviting, he could move a piece of lard if so desired! Aside from enjoying great fire-roasted sardines in the warmer months, João and Adelaide always try to offer a couple of perfectly grilled fresh fish on the menu, such asdourada (gilthead bream), robalo (sea bass) and carapaus (blue mackerel) and every so often, jaquizinhos, tiny fried mackerel served with feijão frade (black eyed peas) mixed with onions and fresh cilantro – a personal favorite. 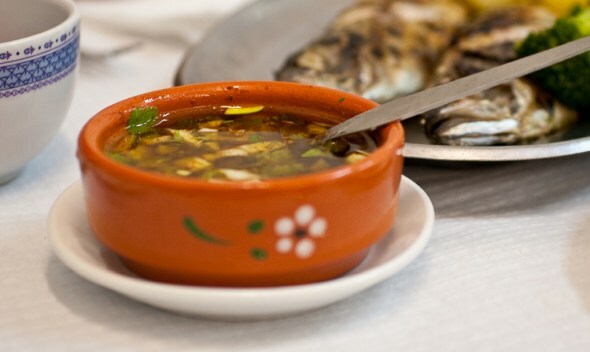 But if you’re in the mood for something heartier, try one of the many regional Portuguese dishes from in and around their northern hometown. For the bacalhau (salt-cod) fans, Adelaide’s Bacalhau á moda do Minho is by far, my all-time favorite bacalhau dish, which is a filet of bacalhau sautéed in olive oil topped with caramelized onions and fried potato rondelles. The buttery smooth texture of the fish and sweetness of the caramelized onions are just melt-in-your-mouth good! If you’re more of a meat person, her version of Cozido á Portuguesa is great, as well as her Chanfana, which is carne da cabra (mature goat meat) marinated in vinho verde tinto for 24 hours then stewed in more wine with garlic, onions, bay leaf, paprika and potatoes, leaving the perfectly purple meat flaking right off the bone. 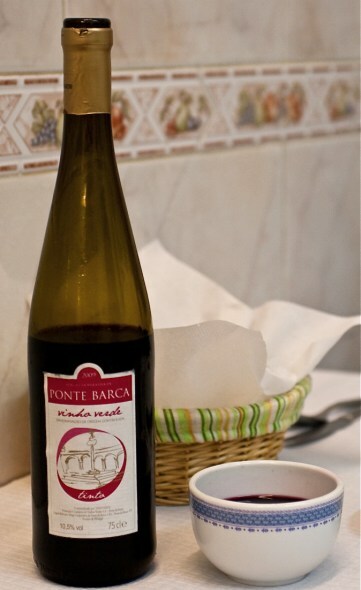 Enjoy it with a bottle of vinho verde tinto, from their native Ponte de Barca, (or with sardines or carapaus which João also recommends it for), and he even provides the traditional taças (small decorated bowls) that the wine is drunk from in the north. And for the true connoisseurs of verde tinto marriages, João and Adelaide offer traditional cabidela da lampreia (lamprey fish with rice cooked in its own blood) pre-ordered a couple days ahead of time as it takes a day to prepare and they have to specially order it from the north to be delivered at the restaurant. A single lamprey fish from the north (which is the best quality lamprey in Portugal) costs 100 euros, due to its limited availability from January to April, and serves up to four people. Now this dish may not seem very appetizing or anywhere near worth the price, but Adelaide has regulars who have ordered it again and again and will buy one lamprey for just two people, so it must be good! 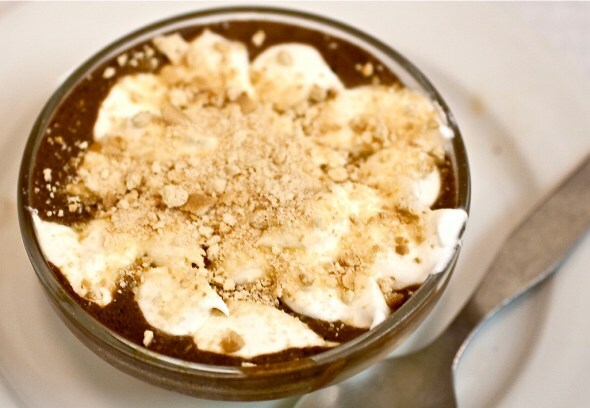 Don’t forget to save room for dessert, as João highly recommends any of his wife’s house-made desserts, especially the doce da casa (house dessert) made from a layer of sweetened, condensed milk and chocolate mousse, topped with whipped cream and crumbled biscuit cookie. Her arroz doce (sweet rice pudding) is equally delicious and lighter feeling than heavier versions of this dessert, as she mixes lemon zest into hers. And if you come on a day that Adelaide has made chocolate mousse, João may recommend a shot of aguardente on top of it, which although may seem strange, is actually common here in Portugal and trust me, once you mix it all up and take a bite, you’ll never want to have plain chocolate mousse again! João also makes an excellent (espresso) coffee every time, for a perfect finish to your meal. It’s hard to remember anytime that I’ve had less than a great meal at A Tasca do João, with Adelaide’s simple yet flavorful dishes and João and Nuno’s friendly, caring service, always checking to make sure that you’re enjoying yourself to the fullest, how can you not walk away from there smiling? I asked João what he loved most about his job and he replied, “everything!” and when this is coming from the man who admitted that he enjoys sitting and peeling a bucket of potatoes for the next day’s service then you can probably be assured he’s telling the truth! If you want to see Portuguese hospitality at its best then you have to plan a visit to A Tasca do João for lunch and let João and his family make you feel right at home, away from home. We need more “Tascas do João” in this world during this economic time, because they are the example of what passion can bring to your business.